At the start of 2018 we compiled our Buy to Let Watchlist and tipped 4 areas as the ones to watch this year. True to form, our predictions have come to fruition. Firstly, Manchester was ranked as the number one location for population and employment growth, and this week city economic experts, City Medic, has confirmed that Liverpool is England’s fastest growing city outside of London. The data stretches over a 20-year period and has highlighted the phenomenal growth of the region. Taking data from the Centre for Cities think tank, experts have uncovered a doubling of Liverpool’s economy since 1998 – only 12 other cities in the UK have managed to do this. Liverpool passed the ‘double mark’ back in 2015 and has continued to enjoy an average annual growth of 4.2%. Over the past decade alone, the city has had over £5 billion invested into it. The transformation isn’t due to stop any time either, with some of the UK’s most ambitious redevelopment plans in the pipeline, notably with Liverpool Waters and Wirral Waters to name just a few. With a firm international status, Liverpool has become a hotspot for investors, tenants and businesses. Property prices here are predicted to rise by 22.8% over the next 5 years and once these large-scale projects are complete, Liverpool’s popularity is guaranteed to soar. 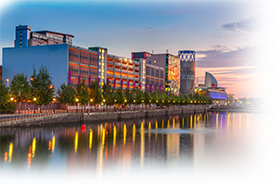 “It seems like Manchester has some stiff competition from Liverpool for the fastest growing city outside of London. We’ve focused on northern buy to let deals for several years now and there’s no doubt of Liverpool’s popularity, particularly with our investors. If you’re considering a buy to let investment property in Liverpool, speak to a member of our team today on 0800 011 2277 or contact us here. We have several discounted and high yielding investment deals in Liverpool which are fully tenanted and producing an income from day one.